Kerli is simple and light WordPress theme. Suitable for personal blog, photography, magazine, publishing, business and any kind of sites. 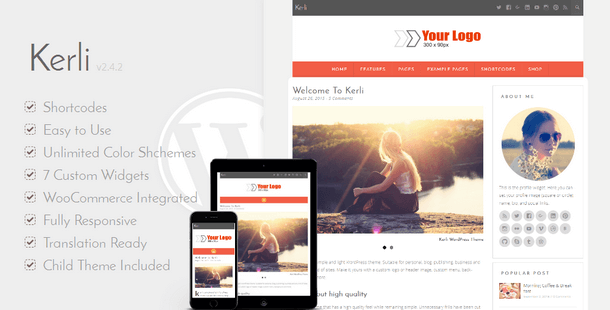 This Kerli Premium Version is Fully optimized code and SEO, better responsive, easy to customize and maintain and comes with several custom widgets to create awesome websites to highlight your content. Kerli is distributed under the terms of the GNU GPL. You may customize the theme in every way you want. Support for all modern browsers (IE9+, Firefox, Chrome, Safari, Opera) and also tested to work flawlessly with WordPress Multisite Installations. Kerli has included a collection of the most popular Google Webfonts. Change fonts for headings and text very easily with only a few clicks in the theme customizer. Kerli has been coded with care and by keeping performance best practices and WordPress coding standards in mind. A selection of page template are available on premium version. This gives you the option to have pages selection. You may customize Kerli WordPress Theme as you like. Files to create a custom child theme are already included in the download package of this WordPress theme. Kerli has been coded with keeping SEO best practices in mind to create a solid fundament for good rankings. Start selling your products today using the popular WooCommerce plugin. Everything is perfectly integrated. Built-in Author Box, Responsive Slider, Related Posts, Sidebar left or right, Custom Menus, Custom Header, Custom Widgets, Custom Page Templates, and many more.